Every time the last egg is used, there is a mental game of ping pong in my head over whether or not I should keep it to re-use for who knows what. Truth be told, I love stashing empty containers, paper tubes, and egg cartons away for a learning activity or craft. It is always when I don't keep the carton that an idea strikes, so I say just save it! ha! 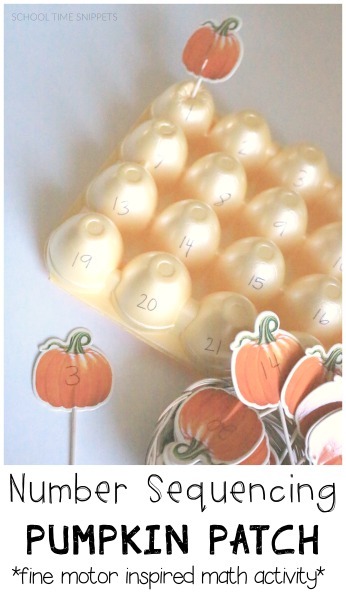 Thankfully, an idea DID strike-- a stryofoam egg carton makes a great base for this Number Sequencing Pumpkin Patch. This activity was inspired by our popular fine motor letter matching activity using an recycled box. 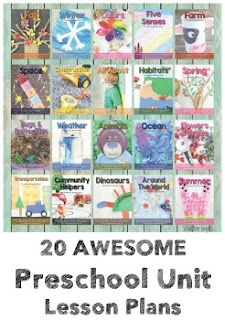 I couldn't not show and share how easily you switch the activity up depending on season and what your child is learning!! Check it out! 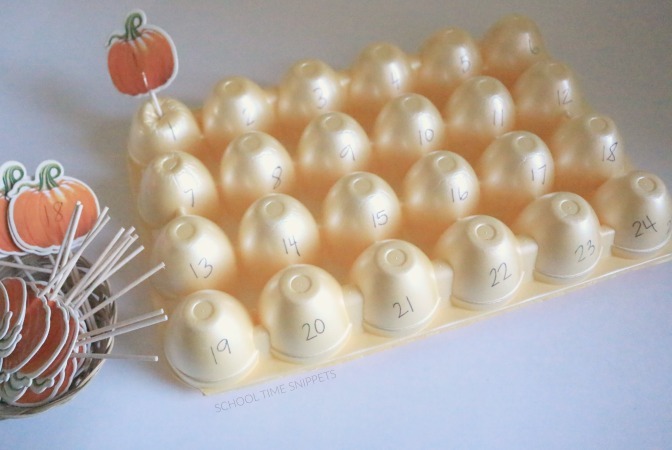 Set up this activity by flipping the egg carton upside down and writing numbers 1-25 where each egg would have been. I wrote 24/25 on the very last egg holder. Punch a hole in each egg holder with the cupcake topper. 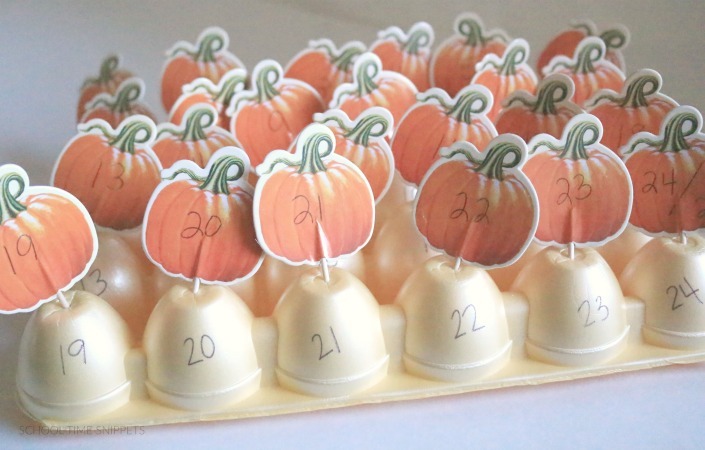 On each cupcake topper, write a number 1-25. I wrote the numbers 24 and 25 on one pumpkin. Place the pumpkins in some type of bowl and present activity to child. Have your child pick up a pumpkin, identify the number, and find it on the egg carton pumpkin patch. Once he/she has found the number, have him place it in the egg carton. Do this activity in reverse. 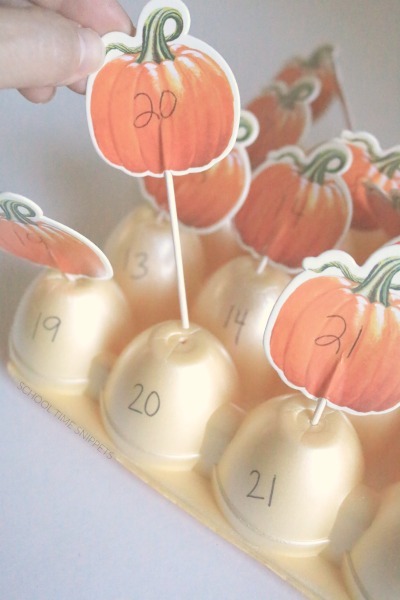 Set up the pumpkin patch and have your child pull out the numbered pumpkin that you call out. Make it a game by rolling dice, adding numbers and pulling the number out. Whoever has most pumpkins wins! Make up your own activity! Do you keep a stash of recycled materials, too? You should! You never know when a creative educational idea will strike!